3 Bedroom Flat For Sale in Folkestone for Guide Price £185,000. Very rare do you find a apartment of this size, located over 2 floors with 3 bedrooms, 2 en-suites and a family bathroom offering flexible space for all the family. 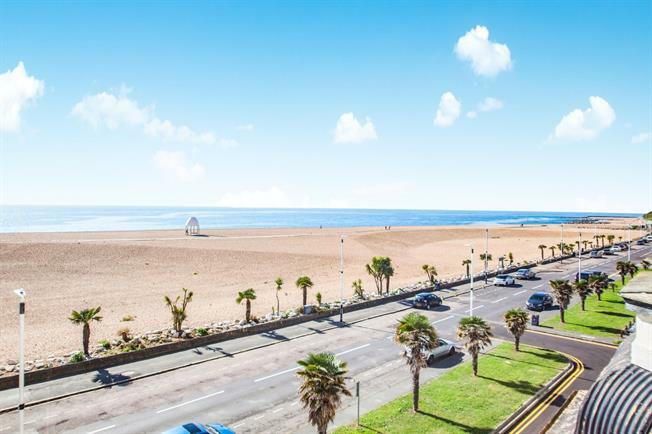 The apartment is located on the top floor of this fine Victorian building and once inside you will be truly spoilt with space and stunning sea views. The lounge is 27ft and opens into a kitchen area making this a fantastic space for entertaining and of course offering fantastic sea views. Inside you will find plenty of storage cupboards including 2 large eves storage areas. There a fantastic range of amenities all close by with the harbour arm and a variety of restaurants and bars. Located yards from the beach which will of course see the new seafront development making this an exciting investment. In our opinion with the apartment being so high up we feel you will retain most of the views, however we urge you to check the current plans for the seafront development as this may change. There is permit parking to the front making parking more accessible for residents. There is no chain and urge any interested parties to view internally to appreciate the size and features on offer.